With Industry 4.0 revolutionising the world of manufacturing, it is essential for facilities – large and small – to keep up to speed if they want to remain competitive. Increased cost pressures, heightened quality standards and shorter lead times are just a handful of expectations now placed on the industry. That makes efficient working practices more important than ever before. As a result, the Factory of the Future is what everybody is speculating about. How can factories evolve to accommodate the varying demands placed on them? How can existing legacy equipment be brought into the realm of the smart factory? How can small manufacturers keep up without undergoing a complete digital overhaul? Think about your existing factory and the only fixed elements are the walls, floors and ceilings. Everything else is mobile, with modular assembly lines and machines that freely adapt to new purposes. It’s that variability which delivers a competitive advantage for manufacturers, and tangible benefits for their customers. For manufacturers which are operating in a more competitive global marketplace than ever before, enhancing levels of quality and elevating affordability by decreasing overheads is even more crucial. The good news is that the Factory of the Future makes all of this possible. The key is to remain agile, creating a smart factory which allows production lines to be easily reconfigured so that facilities can adapt to fast-changing requirements. That’s where small manufacturers have a significant advantage. With less infrastructure, shorter chains of command and fewer layers to production methodologies, changes can be adopted more easily. Once in place, manufacturers have the ability to be more agile than ever before. Before you make any changes, making sure they deliver the impact you need is crucial. 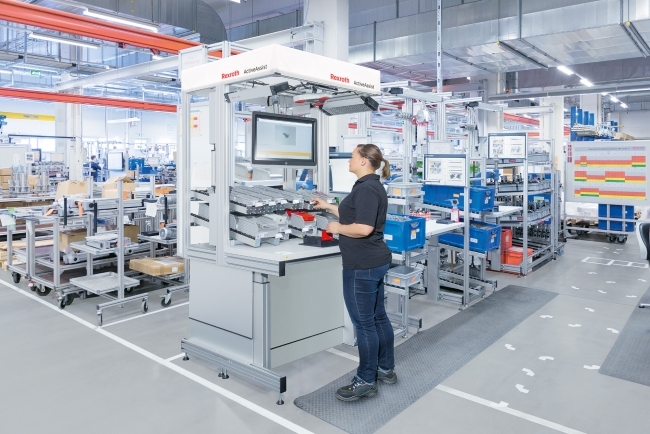 With configurator technology from Bosch Rexroth, manufacturers can create a virtual replica of their entire facility – essentially a testbed for any new solutions. From there, processes can be mimicked so that any new products can be assessed before being implemented, equipping manufacturers with detailed insights into how their facility could be improved. Once implemented in the Factory of the Future, all hardware modules and functions can be represented digitally in real-time. Sophisticated software can collect, transfer and process data to continuously improve processes and facilitate machine learning. Wireless technology has the potential to mobilise machines and plants, with inductive charging and 5G connectivity making for faster and more stable means of data transfer. In practice, that means simplified conversions to new processes for maximum flexibility. Production configures itself independently in-line with the product to be manufactured, communication between machines and systems is wireless and production layouts are optimised for greater efficiency. Coupled with real-time data capture and analysis, continuous improvement becomes reality. With all that flexibility, the Factory of the Future is a place which is entirely adaptable, perfectly positioning manufacturers to create products of enormous variety while maintaining consistantly high standards of quality. That combination makes every manufacturer unique, delivering an undeniable edge when competing on the world stage – something made possible by the digitisation of the industry.